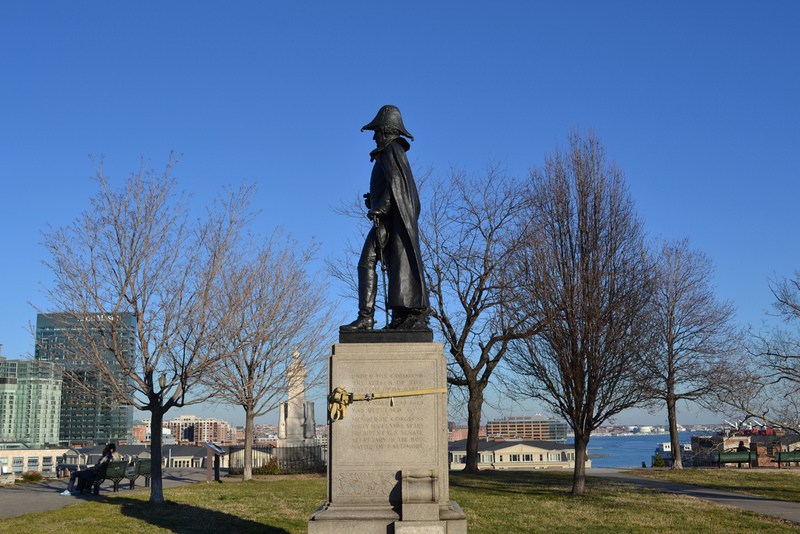 Overlooking the Inner Harbor from Federal Hill stands the statue of Major General Samuel Smith (1752-1839). Smith's life as a Revolutionary War officer, merchant, ship-owner, and U.S. Senator earned him the experience and fortitude in the momentous crises before to successfully command Baltimore during the War of 1812 and its darkest hour: the British attack on Washington and Baltimore in 1814. The statue, funded by the city's 1914 centennial celebration of the Battle of Baltimore, is the design of sculptor Hans Schuler (1874-1951) who studied at the Maryland Institute College of Art. The statue was first erected at Wyman Park Dell at North Charles and 29th Streets in 1917 and dedicated on July 4, 1918. In 1953, the Recreation and Parks Department moved the sculpture to "Sam Smith Park" at the corner of Pratt and Light Streets, the future waterfront site of the 1980 Rouse Company Harborplace project. In 1970, with the Inner Harbor renewal project underway, the statue moved again to the present site on Federal Hill, where in 1814 a gun battery had been erected and the citizens of Baltimore witnessed the fiery bombardment of Fort McHenry. Scott S. Sheads, “Major General Samuel Smith Monument at Federal Hill,” Explore Baltimore Heritage, accessed April 23, 2019, https://explore.baltimoreheritage.org/items/show/190.